If you own a PC or Mac using an Intel processor and have been patiently waiting for Spectre and Meltdown patches appear on Windows Update or Mac App Store updates, you shouldn't download it. That’s the latest directive from Intel, who cited spontaneous reboot and system instability problems – first reported January 11 – following its latest firmware patch aimed to defend against the Spectre and Meltdown exploit vulnerabilities. The company issued a blog post today warning both its partners and end users. Intel is just now getting to the bottom of the problem, having identified the root cause of these issues in Broadwell and Haswell-generation chips. The firm claims to have already issued early versions of fixes for these issues to its partners, but not yet a final release. For the latest on how to protect yourself from Spectre and Meltdown, read our comprehensive guide linked above. However, Intel has yet to directly address similar issues affecting both older and more recent processors than the Broadwell and Haswell families, namely Ivy Bridge, Skylake, Kaby Lake, and Coffee Lake generations. However, it has named processors from those families as suffering from the problem in official documentation. 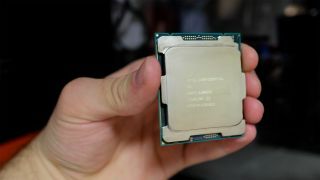 In short, while computing device vendors and other Intel partners work with Intel to fix these issues at the top level and hopefully avoid these faulty patches, the firm also asking end users to stay away from the latest processor updates. However, the firm stresses users should keep their devices up-to-date and secure with with all other software releases. If your machine automatically updates through Windows 10 Update or the Mac App Store and you’re experiencing these problems, it’s unknown when a fix will be available for you.